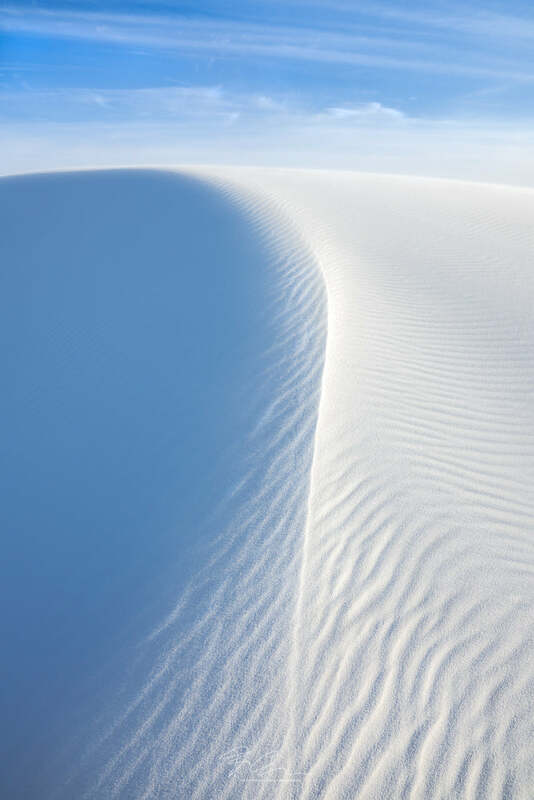 White Sands National Monument in New Mexico. A99II, Zeiss 16-35ZA @ 24mm. What an amazing sight, and so well captured. Maybe also a candidate for a B&W conversion? White sands is very unique, I believe that a B&W conversion would lose the sense of place and, more importantly, that lovely cyan color on the sands that matches the sky. That said, I never convert under the fact, I shot some B&W at the location, but I didn't like the result. One of the best sand dune images I have ever seen. Of course, I like simple, clean images and this has that and much more. And while I routinely experiment with black and white for sand dune images, I agree, that in this case I strongly prefer the pastel blue and white that evokes an almost surreal calmness. Great shot and a great 'portrait' shot from here to capture that lovely gentle curve in the dune. The texture works well, though I wonder if it's a fraction over exposed, especially near the top of the dune where it almost matches the sky there for brightness? I'd like to see what a gentle 'tweak' in something like Curves might do for this, or even a reverse gradient applied to the length of the dune to see if one can tease a little more contrast out (and therefore structure) in the shadow dune area and also drop that brightness just a fraction. However, that said, I also know (form those that have been there) that this is a notoriously challenging place to photograph in and I think the dynamics of the shot are first rate. Oh - and I can't wait for the Yucca images! Thanks for sharing and best regards, Neil. Thanks Neil! (And everyone else). This is generally a high-key image, but I'll tweak the top of the dune a little bit. Thanks for the suggestion!